I’m honored to be partnering again with the North Carolina Department of Agriculture and Consumer Services again. And today’s post is a doozy! 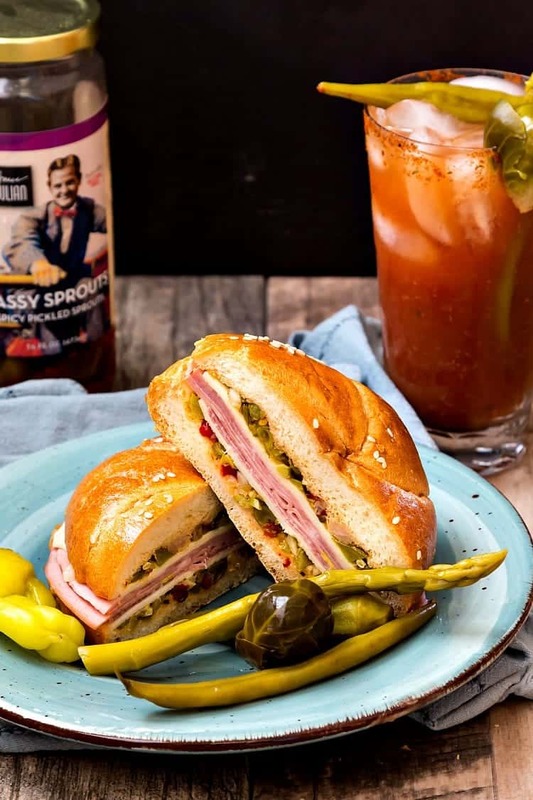 Not only am I going to share my recipe for an absolutely decadent North Carolina Muffaletta sandwich, but I get to tell you all about Bruce Julian Heritage Foods, a Got To Be NC partner. And as an added bonus, there’s a roundup of other Got To Be NC bloggers’ posts about NC food producers and fantastic recipes made to feature these local products. All this to get you ready for the Got to be NC Festival happening at the NC State Fairgrounds May 19-21. Stay tuned for details on how to score swag and links to all the other #homegrownfare17 recipes! I am honored to be working with the North Carolina Department of Agriculture and Consumer Services and a group of talented bloggers to bring you this Home Grown Fare promotion. Thank you for sponsoring our posts, Got To Be NC! 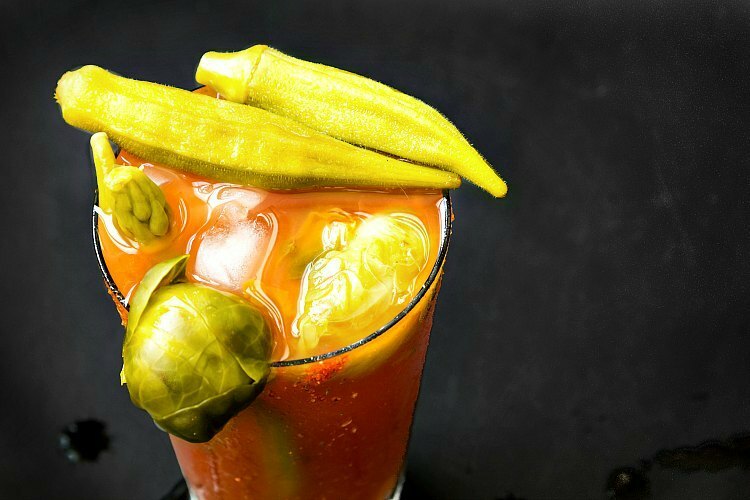 Imagine searching for years for the most delicious Bloody Mary recipe possible. Taking trips, trying new versions, asking bartenders their secrets, and tweaking your own formula until you achieve Bloody Mary Perfection. 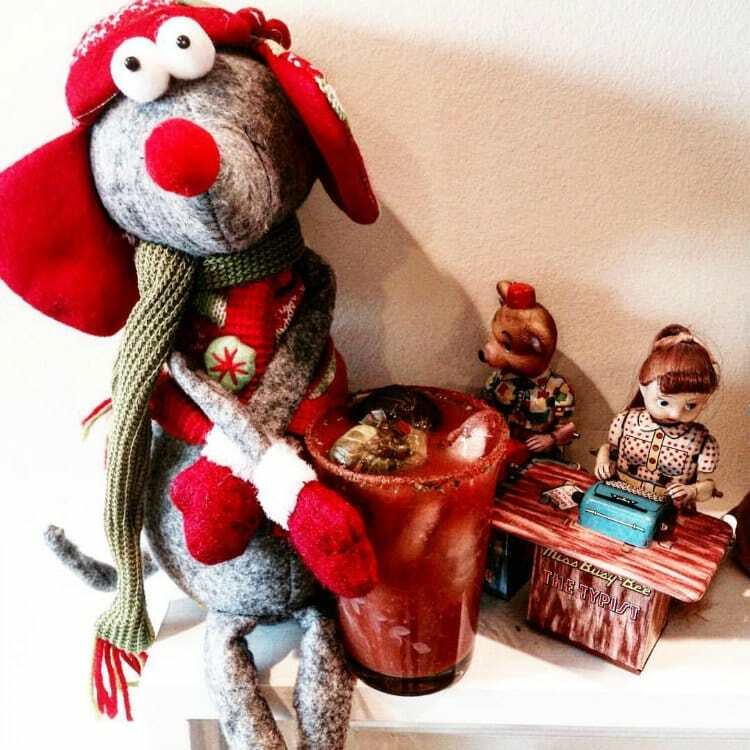 Then imagine that you happen to be a clothier who happens to have a bar in his shop, and you serve this perfected Bloody Mary to your very appreciative customers who immediately clamor for more and ask for gallons of the stuff for parties and tailgating. What would you do? Well, if you’re Bruce Julian’s marketing specialist wife, you start a business with your business partner, and you sell this Perfect Bloody Mary mix in the Carolinas, up and down the east coast, and over on the west coast. You’re in stores, bars, and restaurants in 24 states and even up into Canada. In a nutshell, this is the beginning of the Bruce Julian Heritage Foods story. Bruce Julian’s (and by extension, Bruce Julian’s Heritage Foods) story is truly steeped in North Carolina culture. Bruce grew up working in his father Milton’s clothing store on Franklin Street in Chapel Hill. 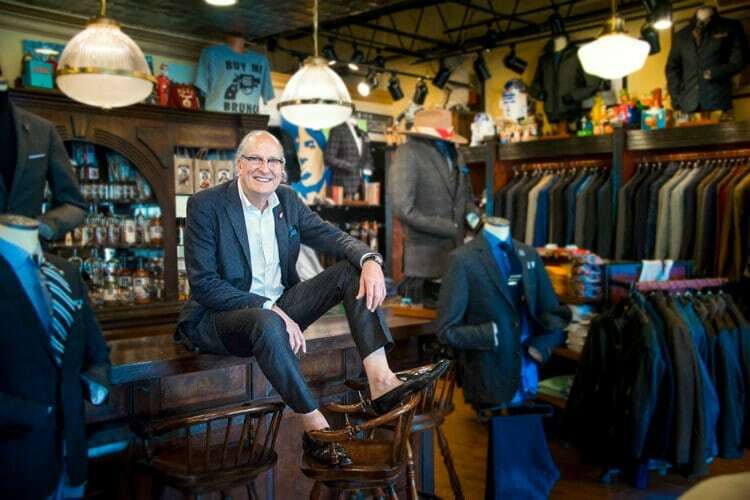 He has been running Bruce Julian Clothier in Charlotte for decades, and it is the place for men in Charlotte to shop for stylish and also surprisingly affordable menswear. I haven’t been to Bruce’s store yet, but when I’m next in Charlotte, I plan to make a pilgrimage. Bruce Julian’s isn’t your average clothing store. Bruce wants his clients to feel like family–he even gives out his personal cell number on the Bruce Julian website–and to enjoy their time in the store. 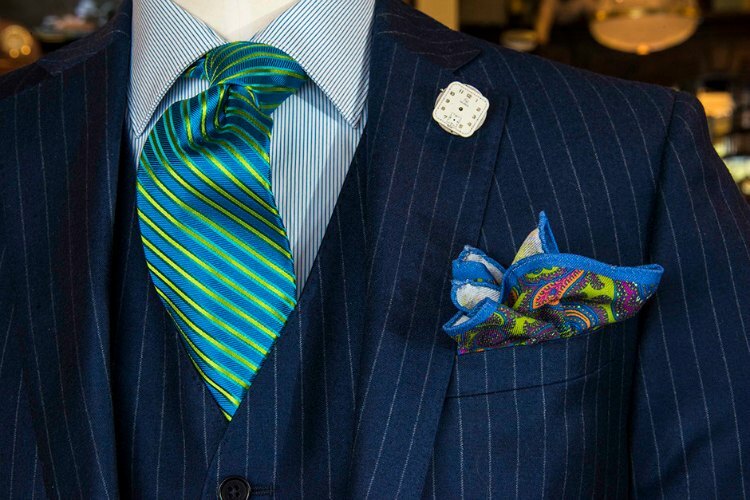 And that means having Bloody Marys at the ready and just some of Bruce’s vast antique toy collection scattered amongst the dress shirts, natty suits, and brightly colored pocket squares. I expect that, when I do show up at Bruce Julian’s door, I will feel as if I have stepped into a shop on Diagon Alley. That serves Bloody Marys. Wonderment! Earlier in the post. I said the Bloody Mary mix was just the beginning of Bruce Julian Heritage Foods. And their mix is pretty special, I must say. It is sweeter than many mixes I’ve tried, but the sweet in front of my mouth gives way quickly to savory in the back and a bit of heat going down. A lovely, fruity aftertaste lingers. With vodka or as a virgin cocktail, it is seriously delicious. Just salty enough, well balanced and kind of hard to stop drinking. Oh, and did I mention that some of the best bars feature Bruce’s mix as their Bloody Mary mix? Check out their Where to Buy page, and see if there is a bar or restaurant serving Bruce Julian’s near you. Like any good business, Bruce’s wife Bonnie and her business partner Paul wanted to grow Bruce Julian’s Heritage Foods. But how to improve on perfection? They didn’t. Because it really can’t be done. Perfect is perfect, and their Bloody Mary mix is pretty darned perfect. Rather than developing a hotter mix, a sweeter mix, a smokier mix, etc, their base mix stands alone. If you want it hotter, there’s a Bruce Julian picante pepper sauce to add to it. Smokier? Garnish with bacon. Sweeter? Add a splash of agave or orange juice. Or use a flavored rather than plain vodka. Bruce Julian recommends tomato, cucumber or pepper vodka. With the Bloody Mary mix as the cornerstone of the brand, Bonnie and Paul have grown their product line informed by the mix. Think refined summer brunch in the South. First, to flesh out the Bloody Mary: Pickled vegetable garnishes, the aforementioned hot sauce, glass rimmer. Light snacks? Couch Mix and Sweet Tooth Mix to the rescue. Full -n brunch mode? Bruce Julian has you covered with everything from stone ground grits to a shrimp & grits kit to sugar cured ham. Bruce Julian Heritage Foods also produces a line of beautifully balanced jams to go on biscuits or cornbread, to use as glazes, or even to serve with cream cheese and crackers. Their Balsamic Sweet Onion Jam makes me go weak in the knees, and their Orange Apricot Preserve is bursting with juicy flavor. 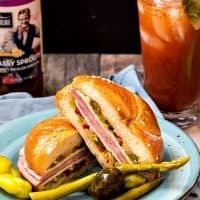 As much as I love their jams, once I learned that Bruce’s travels in search of the perfect Bloody Mary took him to New Orleans and that they sold a line of pickled vegetables, I had to make a North Carolina Muffaletta. I didn’t have a choice! Bruce Julian’s cousin is clothing designer Alexander Julian. My brother Greg was a huge fan of Alexander Julian clothing. He had very good taste. 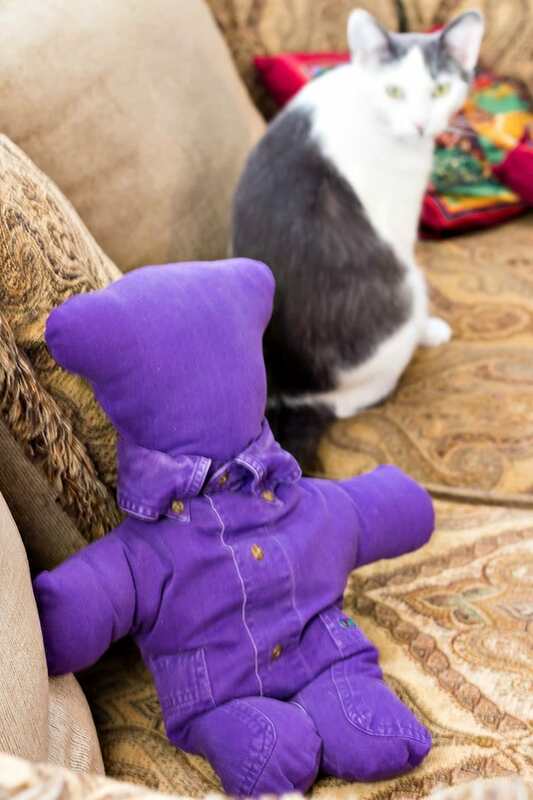 Not long after Greg died, my mother made some teddy bears out of a few of his favorite shirts. The one I have is made of a solid purple, Alexander Julian shirt. I have long wanted to work with Bruce Julian Heritage Foods, because I really love their products. And they are also very nice people. So when the opportunity to put together a blogger tour to highlight the Got To Be NC brands in the Home Grown Fare at the Got To Be NC Festival arose, I staked my claim to the Bruce Julian crowd, pronto! Now that you know about Bruce Julian Heritage Foods, you really need to hear about the Got to be NC Festival. The Got to be NC Festival is a celebration of all things North Carolina. Food, fun, farming, music, rides, and more. There’s a carnival midway, a display of antique farm equipment (and a daily tractor parade), a full slate of music concerts (including a bluegrass battle), a rabbit and cavy show (bunnies!!! ), and of course, the Homegrown Fare, featuring Got to be NC food producers sampling everything from barbecue sauce to popcorn to wine and beer to bread, jams, and salsa. This year, the Homegrown Fare will take place in the Expo Center at the fairgrounds. Don’t forget to check out the Bruce Julian Heritage Foods booth at the Homegrown Fare presented by Lowes Foods May 19-21 at the N.C. State Fairgrounds in Raleigh. The event, part of the annual Got To Be NC Festival, will feature 100 local food, wine and beer companies. Admission is $3, but you can get in FREE with your Lowes Foods loyalty card. You can get a FREE gift while supplies last by mentioning Pastry Chef Online at the Got To Be NC merchandise booth. And if you buy something at the Homegrown Fare (and you really should–so much goodness to discover), swing back by the Got To Be NC merch booth and take a selfie with the #homegrownfare17 selfie frame. You can end up on the Got To Be NC Instagram feed! Click for more information about the Homegrown Fare and the Got To Be NC Festival. 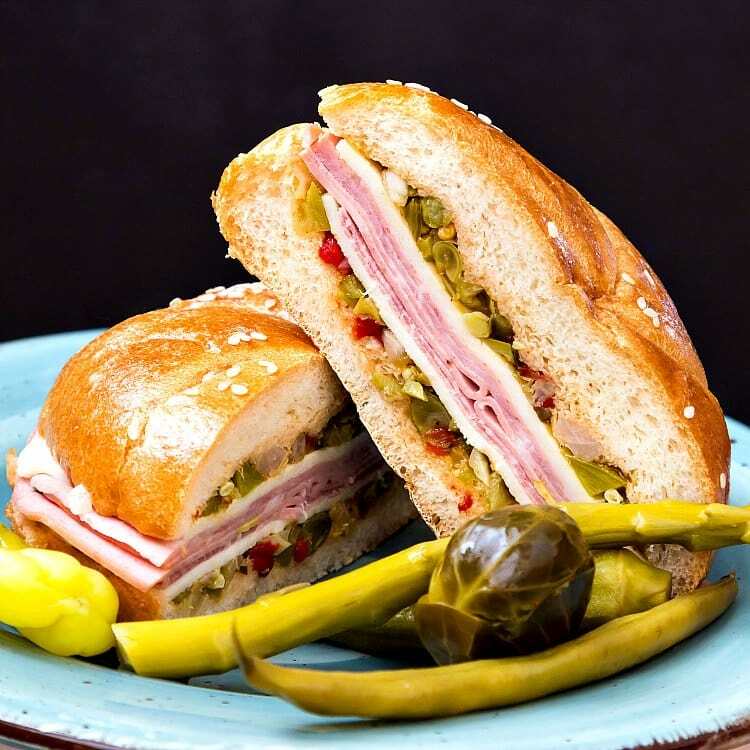 A traditional muffaletta (or muffuletta) is a New Orleans classic that originated at Central Grocery around 1906. Most definitely not a Cajun dish, the muffaletta is basically an Italian antipasti spread served on a sandwich for less-messy consumption. A round of soft Italian bread, an olive-oil soaked, garlicky olive salad, and a pile of Italian mortadella, ham, salami, and provolone cheese. For my North Carolina Muffaletta, instead of traditional olive salad, I chopped up a mix of Bruce Julian Sassy Vegetables: spicy pickled green beans, pickled asparagus, and spicy pickled Brussels Sprouts. ** You can also add in some chopped pickled okra, but it does what okra does when it’s cut. It gets a bit slick, and that can cause the sandwich fillings to slide. Not what we want. 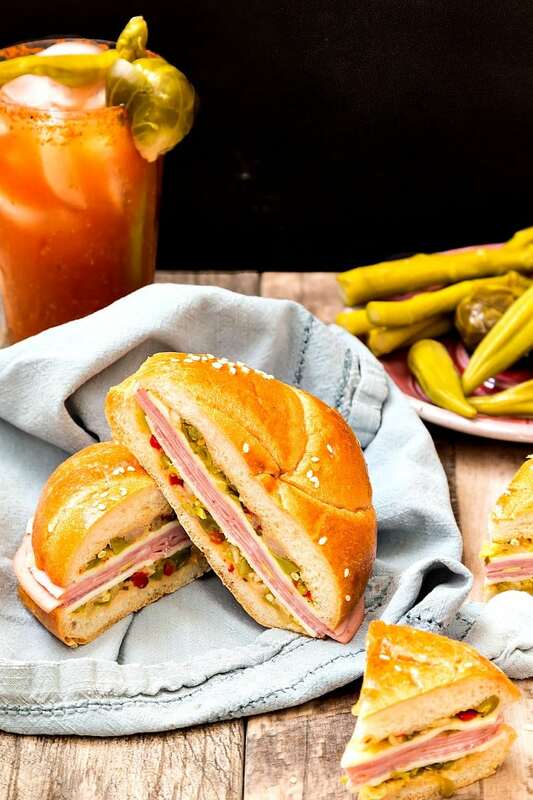 Save the okra for garnishing your Bloody Mary and keep your sandwich in one piece. I also chose to make my North Carolina Muffaletta Sandwiches as individual sandwiches rather than on one large round loaf. If you want to continue with the Bruce Julian southern brunch theme, use really small buns and make muffaletta sliders. One of the great things about a muffaletta is they are much better when wrapped tightly in plastic wrap and weighted down for a few hours or even a few days. This gives the flavors a chance to blend, the oil and spices from the pickled vegetable salad to soak into the bread, and compacts the sandwich so it stays in one piece down to the last bite. Let’s make some North Carolina Muffalettas, shall we? These individual North Carolina Muffaletta sandwiches sing with the flavor of pickled vegetable salad. Make them the night before and weight them down in the fridge so the dressing has a chance to soak into the bread. Put all ingredients in a medium sized bowl and stir well. Cover and refrigerate for a couple of hours to allow the flavors to marry. Spread about 1/4 cup vegetable salad on each side of the buns. Top the salad with a slice of provolone or Swiss cheese. Add a slice of mozzarella on top of the provolone or Swiss. Layer on 3 slices of mortadella per sandwich, followed by 2-3 slices of salami and 2-3 slices of ham. Place the top bun (with salad and cheese) on top of the sandwich. Press down to compact and then wrap tightly in cling film. Place all the sandwiches on a tray and place another tray on top. Use some cans to weigh the top tray down, and refrigerate the sandwiches over night or up to 5 days. Some people like their muffaletta sandwiches heated through. If this sound good to you, remove the cling film and wrap each sandwich in foil. Heat for about 10 minutes in a 350F. Other people say the bread should be warm, the cheese somewhat melted, and the meat still cold. I've found that unwrapping them and heating them in the toaster oven for just over 4 minutes does the trick for me. There is a third group of people that say a muffaletta should be served at room temperature. In that case, just remove the sandwiches from the fridge a good hour or 1 1/2 hours before eating. Any way you choose to serve them, do make yourself a Bruce Julian Bloody Mary to go with! Obviously, prep time does not include the time for the salad to mature in the fridge or to press the sandwich. 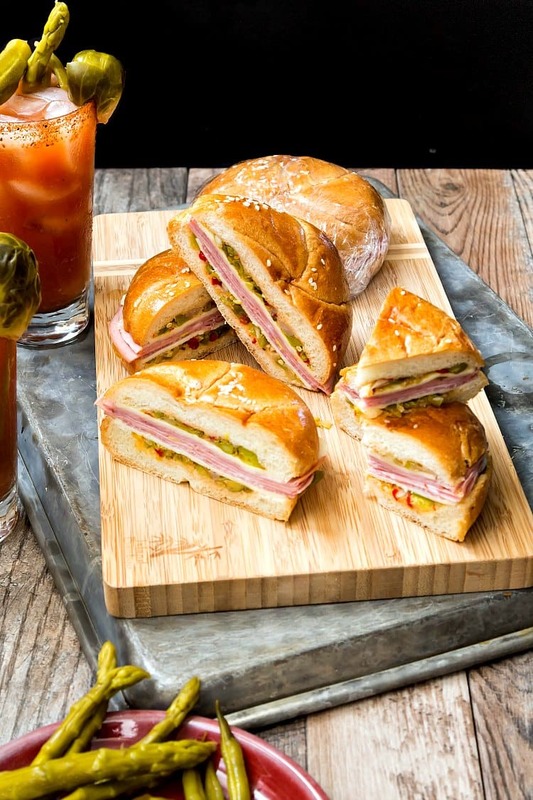 Now, while you are munching on your North Carolina Muffaletta, please take some time to read all our other bloggers’ posts. Most of these folks ship, so even if you don’t live in North Carolina, you should be able to try some. And if you do live in North Carolina, I bet you’ll find some new local brands to love. Because that slogan, goodness grows in North Carolina? It’s true. **Why pickled Brussels Sprouts? They might not be conventional as a Bloody Mary garnish, but they are delicious, and they are Bruce’s wife Bonnie’s favorite!